Mama Mzungu: I am a Kenyan grandmother. Kind of. Last night while putting my 4 year old to bed I cuddled him so hard I nearly smothered the poor little guy. I kissed him all over and tickled him, delighting in his laughter even as I knew this was bedtime play was ready to backfire. I didn't care. This intimate, playful, loving closeness is my favorite thing about motherhood. And then, as we both settled down into our more sleep-inducing routine of lullabies and back patting, my mind wandered. It wandered back to my village stay and I thought of mothers I met in that poor rural village, and their experience of motherhood. Our experiences of motherhood are worlds away for a lot of reasons. But this stuck out to me: I hadn't seen a single mother play with her children. I hadn't seen a non-baby snuggle. Children put themselves to bed. And there were no terms of endearment issued. No "Sweetheart," "Lovey," or "Pumpkin," so common on American playgrounds. Orders to wash the dishes or pick up a crying sibling were unceremoniously issued and obediently followed. None of this is to say that these mothers don't love their children as intensely. They fret over a child's illness and are uniformly obsessed with finding enough school fees to give their children the best shot at a bright future. To these mothers the saddest fate that could befall them is not baring children. Still, the maternal physical and verbal affection is at minimum - perhaps lost in the necessity of daily chores or simply dictated by generations of parenting culture. Babies are snuggled, held, cooed at, and co-slept with, but when they grow into children they're simply ordered to fetch the water and wash the dishes. It was a bit unsettling for me coming from an intensely affectionate family and demonstrative parenting culture. A culture where parents, bad knees be damned, get on the floor and push a train around a track with junior. Where 10 year olds, to their perennial embarrassment, are still hugged and kissed in public. But, then I noticed something else: mom aside, there actually was no shortage of playmates. Instead of an adult who might quickly tire of kicking around a ball, there always half a dozen little people with similar interest, energy and attention spans to run, play and laugh with. You don't need mom to play with you when you have a constant brood of playmates. And, despite my initial observations, the children did get some of that physical and verbal affection. But instead of from mom, it was from grandma. It was grandma who I saw kissing boo boos and delighting in watching the children play. She was the one more effusive with the praise from a high mark at school. She was the one the kids ran to. My suspicion that grandma was a main source and receptacle of snuggles and affection, was born out the more I spoke with Kenyan mothers. Each one agreed that her mother would tend to "spoil" her children and that children raised by grandmothers are less disciplined and more wild. Not the best pic and there's a huge smudge on my lens. I only got about 50 watts of her 100 watt smile. But grandma was easily the happiest person I met and universally adored by all the kids. I suppose that's often the same dynamic in our own culture. Grandparents think of it as a right and a privilege to indulge their grandchildren. 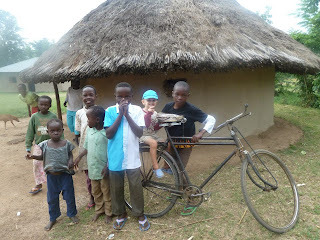 But in the Kenyan village the difference was more stark. Motherhood seems more of a job. A duty. It's not until a woman has grandchildren that she appears to fully enjoy it. In fact, when I asked each mother what they loved most about motherhood, they found the question bizarre and nearly impossible to answer. It really stumped them. Maybe it never felt like a decision they made. They never had to defend the state of motherhood to some dubious childless peer. When forced to finally think about, to a person, they each said what they enjoyed most was the "help" children provided. 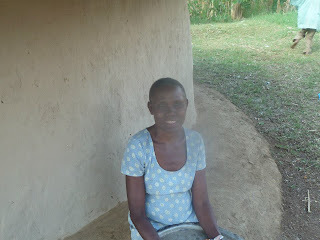 So, maybe modern Western motherhood resembles a lot more the experience of a Kenyan grandmother. Hey, by the time we get around to raising progeny, we're about the same age, and we tend to "spoil" our kids with affection and shower them with praise. More than occasionally we even attempt to be their playmates. And perhaps that's the trouble with modern motherhood. We're trying to be a whole village of people to our children. And it's hard to be their teacher and disciplinarian when we're also trying to be a doting grandmother and a playmate. Maybe it's less confusing for kids to have these roles separated. It's probably less emotionally taxing for the mother. What do you think? Am I way off base here? Kenyans: Is this assessment even correct? Would you "modern mothers" have it any other way? Having been both I will say being a grandparent is more fun as the responsibility for raisng upstanding citizens is no longer mine. It is my daughter's. Happy Birthday 4th Caleb!!! What an amazing post - again. So thought-provoking that I don't have anything to say yet. I need to go away and reflect on this. Thank you! Lovely post. I remember my mother once remarking on how my siblings and I play so much with our children. She said she doesn't really remember doing that - she provided us with siblings instead. I wondered if it was a generation thing but both my parents were very involved and affectionate and they are "bad knees be damned" grandparents. So maybe she just doesn't remember how much she played with us! Very thought provoking post - will be interested to hear how your Kenyan friends respond.